Bancroft Bayliss Loop, looking West from Council Bluffs Iowa to downtown Omaha Nebraska. 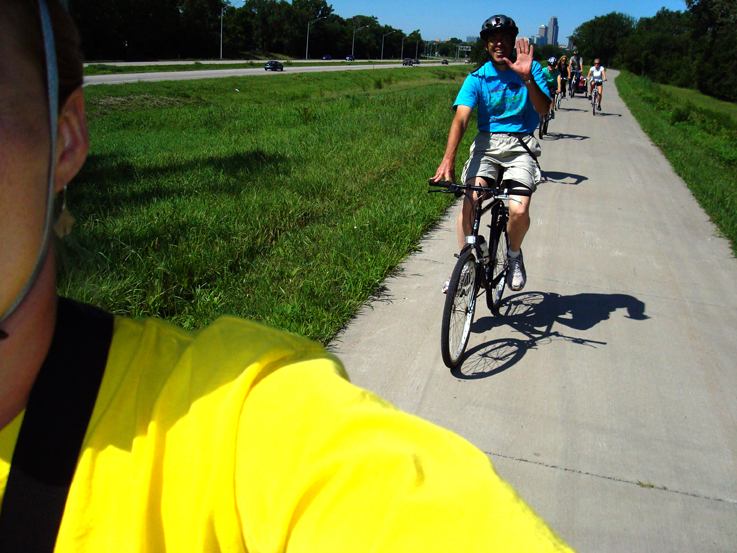 Started in 2009 The Bancroft Bayliss Loop (BBL) is a community forming bicycle ride and cultural exchange engaging artists and cyclists between the Bancroft Market in Omaha Nebraska and the West side and downtown area Council Bluffs Iowa. The BBL was founded by artist Jody Boyer in collaboration with Bill Seidler Jr., founder of the Bancroft Street Market. The BBL is a community based performance, a work of art meant to transform people’s understanding of our two communities. The ride literally and metaphorically takes people on a journey to experience the many urban, social and cultural paradigms of our two communities from the seat of a bicycle. The ride travels a route that explores the Omaha riverfront, the Bob Kerry Pedestrian Bridge, a beautiful natural landscape along the Missouri River, historic downtown Council Bluffs, emerging arts districts and many friendly residential neighborhoods on both sides of the river. The BBL also aims to raise awareness of cycling as transportation in addition to recreation by navigating urban streets not defined as primary bike-ways by either city. By getting people on bikes on streets we hope to advocate for shared roadways and a community cultural shift that sees cyclists as having a fair right to the road. In 2011, Bill Siedler became primary leader of the Bancroft Bayliss Loop, as Jody welcomed the birth of her second child. The Bancroft Bayliss Loop was exhibited in Hopey Changey Things at the Bemis Center for Contemporary Arts.